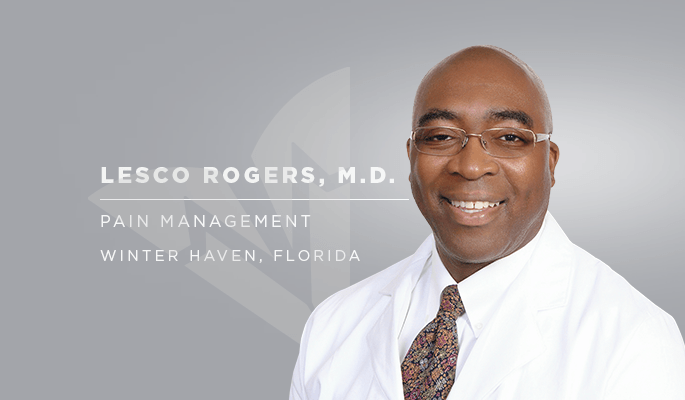 Physician Partners of America announces that physician and inventor Lesco L. Rogers, M.D., has joined its Winter Haven clinic as a pain management specialist. His far-ranging background includes collaborating on the development of a device to treat migraines. The device, called a TNM, was recently approved for home use by the Food and Drug Administration. In addition, he has developed a combination nerve block and topical therapy to treat TMJ and other temporomandibular (jaw) disorders. Born in London, Dr. Rogers received his Bachelors of Science at Lehman College, City University of New York in New York City. He earned his medical degree from the Geisel School of Medicine, Dartmouth College in Hanover, NH. He completed his internship at University Hospital, New York Medical College, Westchester County Medical Center and his residency at the Robert Wood Johnson University Hospital, New Brunswick, NJ. He followed this with a fellowship in interventional pain management and anesthesiology at Georgetown University Hospital, Washington, DC. Dr. Rogers has been a faculty member of the internationally renowned Michigan Head Pain and Neurological Institute, and the Duke University Pain and Palliative Care Clinic. He has also served as an adjunct faculty member at Duke and as a consultant to Boston Scientific and Advanced Bionics. He is certified by the American Board of Anesthesiology and specializes in treating spine-related pain, migraines, trauma-induced headaches and movement disorders. Irma Davila is the Digital Marketing/SEO Specialist for Physician Partners of America. Headquartered in Tampa, Fla., Physician Partners of America (PPOA) is a fast-growing national healthcare company committed to combatting the opioid crisis through interventional pain management. Founded in 2013 with three employees, it has rapidly grown to more than 500, and manages a wide range of medical practices.